This is the best overland tour of Three Parallel Rivers in Yunnan. The construction of Deqin-Gongshan Road, from Yunning Town of Deqin County to Pengdang Town of Gongshan County via Biluo Snow Mountain, is just finished and is around 95 kilomiters. If we choose Deqin-Gongshan Road, we do not need to drive along the Lancnag-Mekong River to Baoshan and enter Nujiang Grand Canyon from Laowo Town. Discover the beauty of Jinsha River, Lancang River, Nujiang River, Meili Snow Mountain, Jade Dragon Snow Mountain and Baima Snow Mountain. 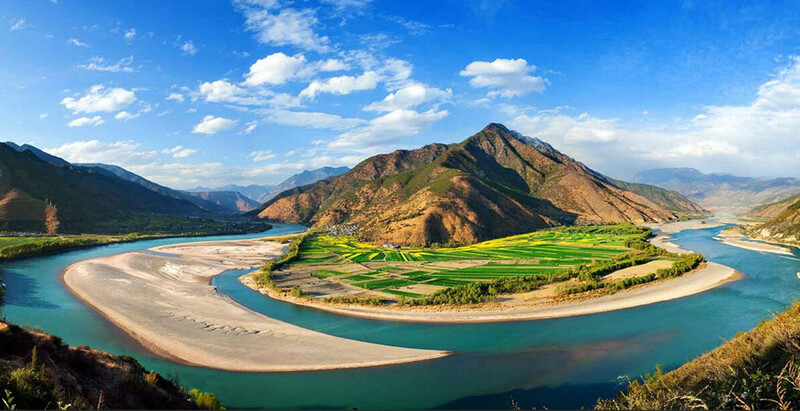 Witness the surge of the rivers and find idyllic scenery in Bingzhongluo. Meet colorful ancient towns, ethnic villages and tribal groups to appreciate the diverse ethnic cultures of Yunnan. Step into a famous historic and cultural city in Yunnan Province–Tengchong city–the hometown of jade. Arrive at Lijiang airport, meet your guide and transfer to hotel. We can take a leisure time around Lijiang Old Town and Black Dragon Pool, which depends on the time of your arrival. Enjoy the sunrise of the Jade Dragon Snow Mountain and Lijiang Ancient Town in the morning. 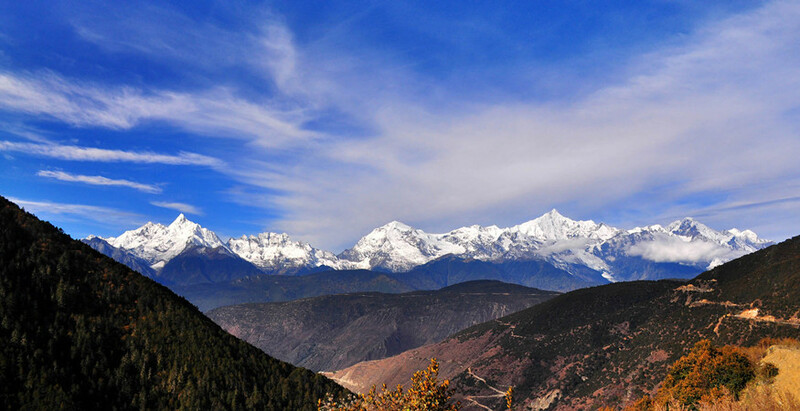 Drive about 30KM to Ganhaizi Meadow(3100M), you will take the sightseeing bus for a short visit through the Baishuihe River, take the chairlift up to visit Jade Dragon Snow Mountain. The cableway will be arranged according to the condition of the moutain. You will hike around 1 hour in the original forest in Spuce Meadow (3200M). After lunch, you you’ll visit Yuhu Village and the Former Residence of Joseph Rock who was an Austrilia American botanist and explorer, lived in Yuhu village and other places in that rergion from 1922 to 1949. He was also a nuturalist and photographer, and the first foreign scholar to introduce Lijiang ethnic culture to the western world. Stroll through Baisha Old Town, which is an enchanting traditional Naxi style old town.Visit the Baisha Murals about 600 years old, which is one part of the World Cultural Heritage by the UNESCO 1997. From Lijiang, you’ll drive about 60KM to the First Bend on the Yangtze River with imposing gorge scenery, visit the Iron Chain Bridge, the Red Army’s Long March Memorial Monument in the Shigu Old Town. The Town of Stone Drum got its name from a large, cylindrical, marble tablet shaped like a drum. The scenery is magnificient as the road running through the Lijiang valley which is filled with wheat fields and drying haystacks. Visit the Tiger Leaping Gorge, the deepest gorge in the world. With 34 rapids of the Yangtze River, it is called Jinsha in this area because you can find gold in the river. Afternoon, you’ll head for Shangri-La, the former Zhongdian which is well-known as the paradise destination for every tourist. Upon arrival in Shangri-La, you will enter the Tibetan cultural area and a landscape of barley fields and yaks scattered in the valleys. Walk around Dukezong Ancient Town, an important town of the Ancient Tea-horse Trade Caravan from Yunnan to Tibet and India. Walk up to the top of Guishan Hill or Tortoise Hill, you will see the largest Prayer Wheel of the world and have a panoramic view of Shangri-La city and Dukezong Ancient Town. In the morning, visit the Ganden Sumtseling Monastery, the largest Tibetan monastery in Yunnan. Songzanlin Monastery has another alias-‘the little Potala Palace’. so named because the whole monastery is in the tradional style with mysterious atmosphere. And afterwards you’ll visit the tranquil Bita Lake & Shudu Lake in Pudacuo National Park. Pudacuo National Park is located in one of the most biologically-diverse regions of the world. While the region comprises only 0.7 percent of China’s land area, it contains more than 20 percent of the country’s plant species, about one-third of its mammal and bird species and almost 100 endangered species. Visit Dabao Monastery on the way back from Pudacuo National Park. Drive back to hotel. In the morning, drive 6 to 7 hours to Deqin County (3400m altitude) which is 187km away from Shangri-La. The view along the way is fantastic with different kinds of trees, streams down the valley, prayer flags and stupas, and Tibetan villages. From Shangri-La, after half-an -hour driving, you will have a panoramic view of Nixi Pottery Village; drive down to the river valley, continue the nice scenery along the Jinsha River to Benzilan Town where you will have lunch. After lunch, drive uphill to the Dongzhulin Monastery which is located in Shusong Village, Benzilan District, Deqin County, and 105km from the seat of Zhongdian County. The Yunnan-Tibet Road passes behind the temple and cars can get straight to the temple. The Dongzhulin Monastery was built in 1667, the sixth year of the Kang Xi Period in Qing Dynasty. 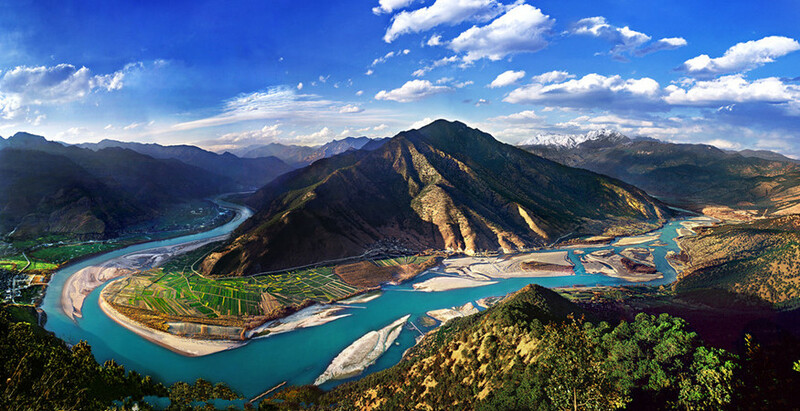 Visit the First Bend of Jinsha River or Moon Bend, which is the boundary between Sichuan and Yunnan. This is different from the First Bend of Yangtze River in Lijiang City. The bend in Shigu Town changes the flow direction of the Yangtze River but in Benzilan, the Moon Bend is just a grand bend between the mountains with an impressive scenery. Visit Baima Snow Mountain Nature Reserve, you will be able to view Baima Snow Mountain if the weather is clear, pass the top part of today at 4292m altitude at 156km. 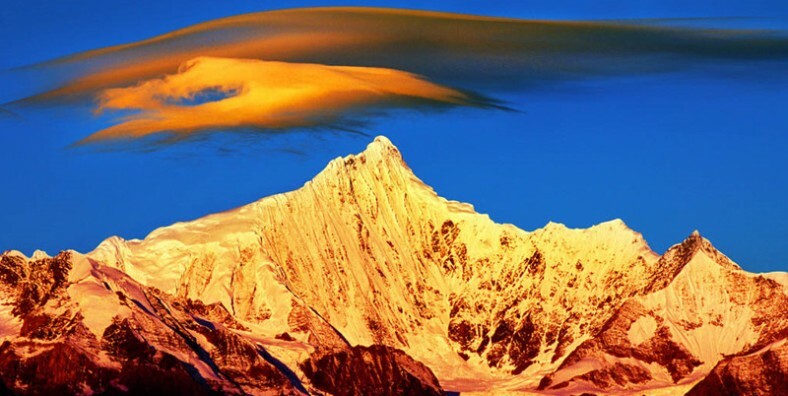 Arrive in Feilaisi in the late afternoon, you will have a nice sunset view of Meili Snow Mountain from the Sightseeing Platform, where you can see the 13 white pagodas meaning of the 13 peaks of Meili Snow Mountain over 6,000 meters (19,685 feet) above sea level, known as the “Prince’s 13 peaks”. 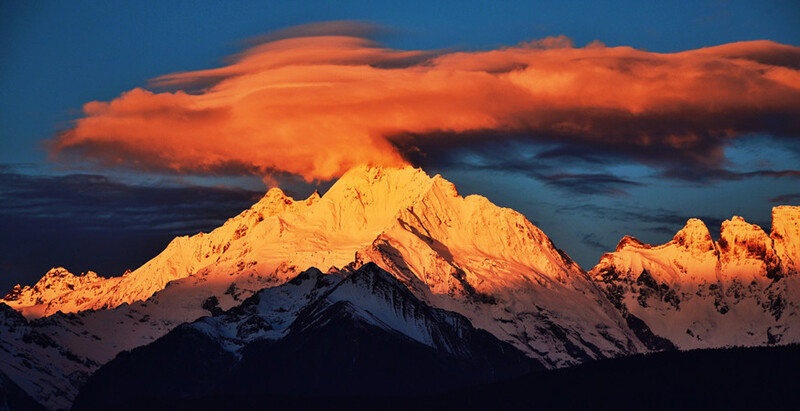 Early in the morning, you will enjoy the magnificent sunrise view of Meili Snow Mountain from Feilaisi, then drive to Mingyong Village. Hike from Mingyong village to Mingyong Glacier(2600m) which is the low altitude glacier of the lowest latitude in the world. After lunch in Mingyong Village, you will trek down directly to the edge of Meikong River(2,050m/6,724ft) . Walk along the Mekong Grand Canyon and arrive in Xidang Village(2,200m/7,216ft) where you can visit some scattered Tibetan houses in the village. In the afternoon, drive south along the Mekong Grand Canyon to Cizhong Village in Yanmen Town with some Tibatan villages on the way. Visit the Tibetan Catholic Church built by French missionaries in 1867, the church is used by Tibetan, Naxi and Lisu people. They still have the grapes planted by missionaries and the old traditional way of making wine. Drive to Gongshan. On the way you can enjoy the beautiful landscapes of the Nujiang Grand Canyon. The 316-kilometer-long Nujiang River Gorge is flanked by two 4,000-meter-high mountains. The mountain peaks on the two sides have an average altitude of over 3,000 kilometers. The gorge is located in Yunnan Province in southwestern China, an area rich in ethnic minority culture. It is now a first choice for many domestic and foreign travelers. One full day excursion to Bingzhongluo, sightseeing includes the first bend of Nujiang River(Salween River), the stone house of the Nu Nationality, Peach Island, the Tibetan Puhua Temple. You will then have the chance to visit a minority household and experience the life of the local people. Leave Bingzhongluo and drive 110 km through the fascinating mountain areas to Fugong. Sightseeing includes a visit to a suspension bridge and a glide cable. Special Lishu food will be served during dinner. Overnight in Liuku. Today, we will continue the driving to Tengchong County. Drive south along the Salween and arrive in Lujiangba Basin. As it’s hot and humid in the gorge here, Dai people who live here use big banyan trees to surround the villages, tropical plants are grown here such as papaya, pineapple, banana and coffee. The famous Yunnan Coffee is grown in this area near the Salween. Arrive in Tengchong, you will visit Heshun Ancient Town including the Museum of Yunnan-Burmese Anti-Japanese War, Heshun Library, the Archway, Dragon Pool, the Wanlouzi Museum of Native Residence, Wenchang Daoist Palace, Clothes-washing Pavilions, Yuanlong Daoist Pavilion, the Philosopher Ai Siqi’s Former Residence, Guanyin Ancient Spruce Trees an so on. Visit Liafeng Mountain National Forest Park in the early morning, climb up to the half mountain, pay a visit to Laifeng Temple bult in Tang dynasty; Climb to the top of the mountain, visit Wenbi Pagoda and enjoy a panoramic view of Dianyue Town of Tengchong County. Visit the Graveyard of the National Heroes, and Dieshuihe Waterfall Park in the town, then drive to Beihai Wetland Park, where you will take a small boat to the lake for a nice view. After lunch, drive back to Tengchong, and visit Rehai Hot Spring Park. You will have an option to enjoy the hot spring in the park. –Tengchong is one of China’s three major geothermal areas, known as “Land Abounding in Geothermal Resources”. There are plenty of springs of hot water and hot vapour, called “Hot Sea”. There are quite a number of hot fields as well. Tengchong is a resort where people can travel, take a bath and have medical treatment. The Hot Sea, with an area of 9 square kilometers, lies 20 kilometers away southwest of the county seat and in the center of the geothermal area. Departure from Tengchong. Service ends.